Well, friends- it’s that time of year again. Thanksgiving is on it’s way and then we’ll be in the mad rush towards the holiday season. This year, I’m giving lots of handmade gifties- especially jewelry- and that’s a pretty small box. So I got to thinking that I should make the box a gift in and of itself. And what if that gift box could double as an ornament? I found these cool paper-mache “wedge” boxes at my local craft store for under a dollar a piece. All it took was some Martha Stewart Paints, Martha Stewart Holiday Icon Stencils, and some Sparkle Texture Effect and I was in business. Add some glass pearls and crystals, and you’ve got an elegant little gift for next to nothing! Let me show you how I made the snowflake box- it’s a lot of steps, but really easy! Assorted glass pearls and crystals for the hanger and tassel, if desired. Start by painting your boxes inside and out you desired shade. Two coats should do it. (I didn’t bother to prime. )Let it dry thoroughly, then add a coat of the Glitter Finish. Love the Glitter Finish to add some extra sparkle! To make the Snowflake box, trim out the snowflakes from the stencil sheet and apply a mist of stencil adhesive to make it sticky and prevent the paint from seeping under. (Trust me, it’s worth the extra step.) Using the foam pouncer, apply the Sterling Metallic paint through the larger snowflake stencil on theÂ top and bottom of the box. Let it dry. Out line it with a white-out pen, if you like, to add some extra “pop.” Let that dry, too. Next, place the smaller snowflake stencil on top of the painted one. Carefully apply some Sparkle Texture Effect through the stencil and lift off. Now you have a fabulous 3-d snowflake. Let this dry thoroughly, too. Apply the Sparkle Texture like spackle. Side note: the Sparkle Texture Effect takes quite a while to dry. I’d set it aside to dry overnight, if you can. Otherwise you risk flattening or smudging it. Ask me how I know. Next, use the Martha Stewart Utility Bone Folder to pierce the box on the ridge where it overlaps. String some crystals, glass pearls, or other beads to create a loop for hanging. Do the same to create a tassel, if you like. Lastly, add some flat-backed pearls and Swarovski crystals to the snowflake for added sparkle and shine. Yeah, I’m a “more is more” kinda girl. I made a second version with a holiday tree, too- I used the same stencil set. Martha Stewart Paint supplies, like the ones used above, are available at your local Michael’s craft store. Product and compensation provided. UPDATE! 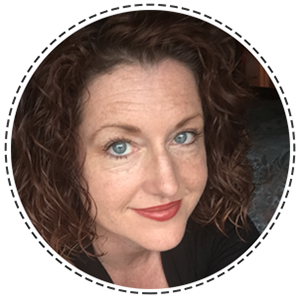 Having a great day….and a giveaway! Follow this link to enter to win a pack of Martha Stewart Paints by Plaid, as well as the Holiday Icon stencil featured above. Jenny, love these ornaments!! 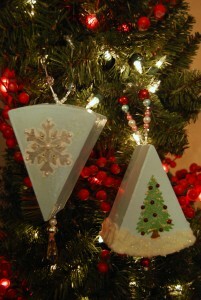 I have some small paper mache Christmas trees and star boxes that would make great little ornaments. Thanks for the inspiration. This is so adorable. I love it. Thanks for sharing. These are really cute, Jenny! They are both so cute but I’m going with the Christmas Tree. Love MS paints & brushes – great quality! Love them both. The snowflake looks elegant, yet fun. Love the snow at the bottom of the tree. It looks like it’s part of the tree skirt. So fun Jenny! I need to try that texture paint. I like the subtle texture you did, very cute.